IDEA College Signing Day at State Farm Arena Thursday, April 26, 2018, in Hidalgo. HIDALGO — Come fall, twins Anthony and Luis Donaldo Pulido will be living their dreams and attending universities in New York. The siblings will soon graduate from a class with a 100 percent college acceptance rate at IDEA Weslaco. During IDEA’s College Signing Day on Wednesday, the Weslaco Colts, Frontier Chargers and Quest Blazers announced their future plans on stage at the State Farm Arena. 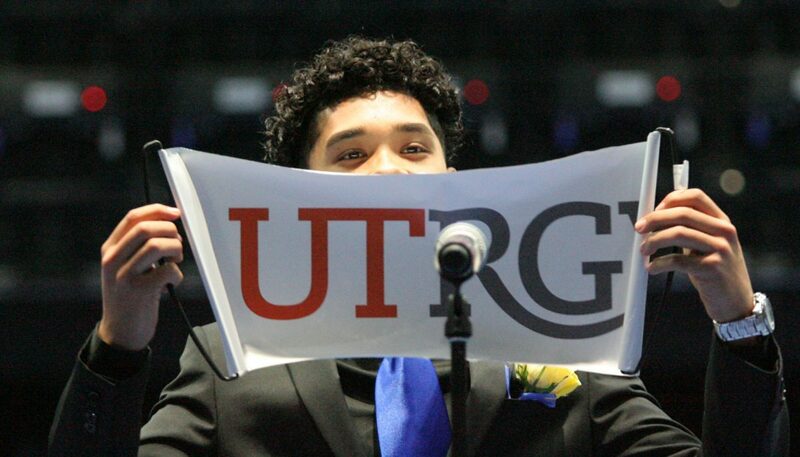 Pupil after pupil stepped on stage to unravel their college banner. 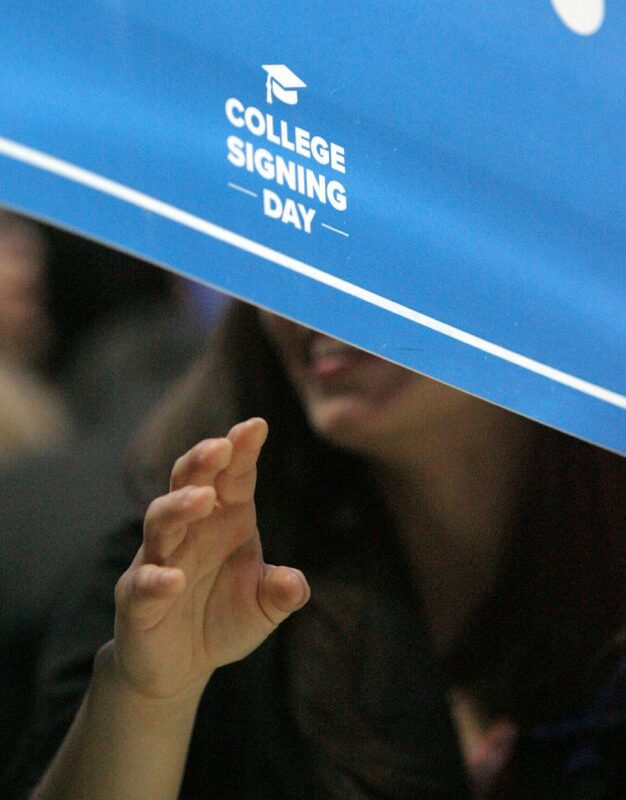 Julissa Ann Garcia, 18, of Harlingen, raises her school banner during IDEA College Signing Day at State Farm Arena on Thursday, April 26, 2018, in Hidalgo. 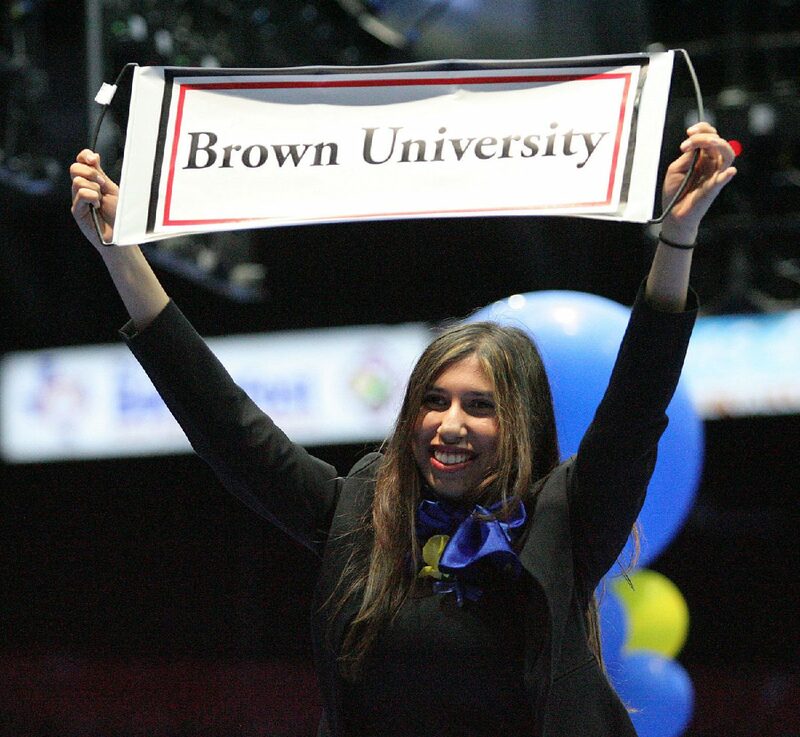 Garcia will attend Brown University in the fall semester. 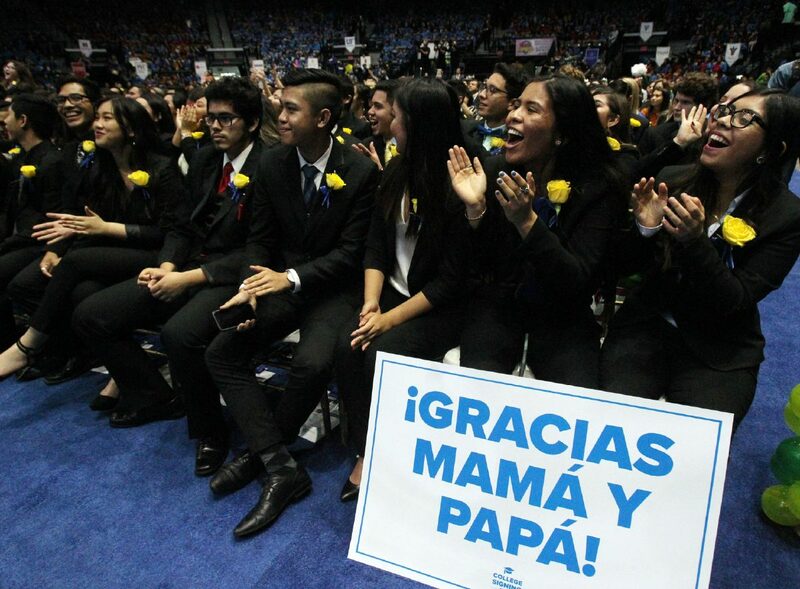 IDEA graduating students cheer as other students take the stage to announce the school they will attend this fall during the IDEA College Signing Day at State Farm Arena Thursday, April 26, 2018, in Hidalgo. 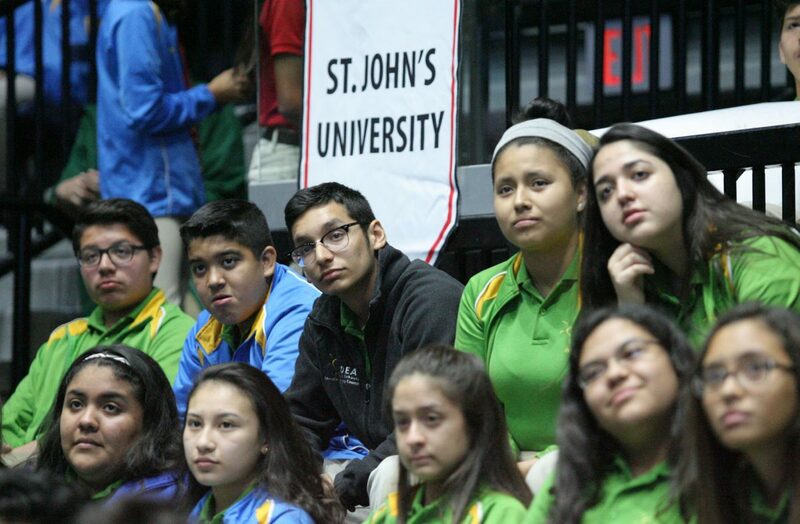 IDEA students watch the stage as IDEA graduating classes raise their banners designating the universities they will attend this fall during the IDEA College Signing Day event at State Farm Arena Thursday, April 26, 2018, in Hidalgo. 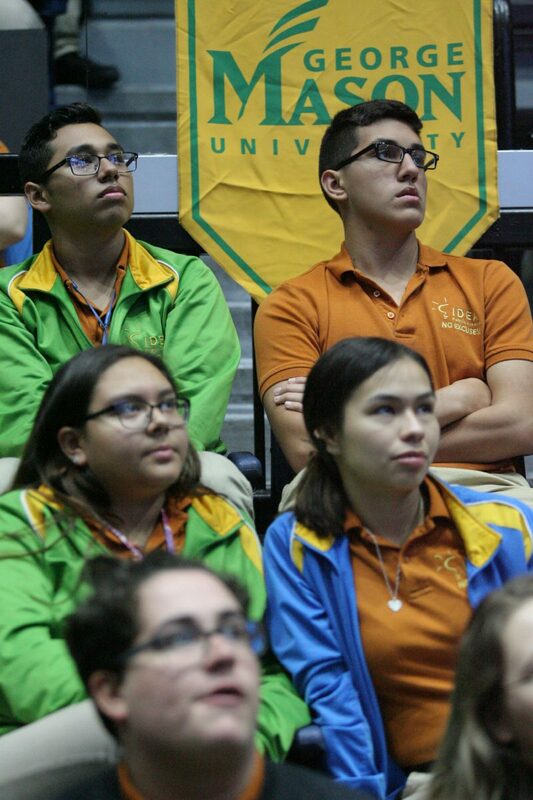 IDEA students watch the stage as IDEA graduating classes show their banner to the universities they will attend this fall during the IDEA College Signing Day event at State Farm Arena Thursday, April 26, 2018, in Hidalgo. 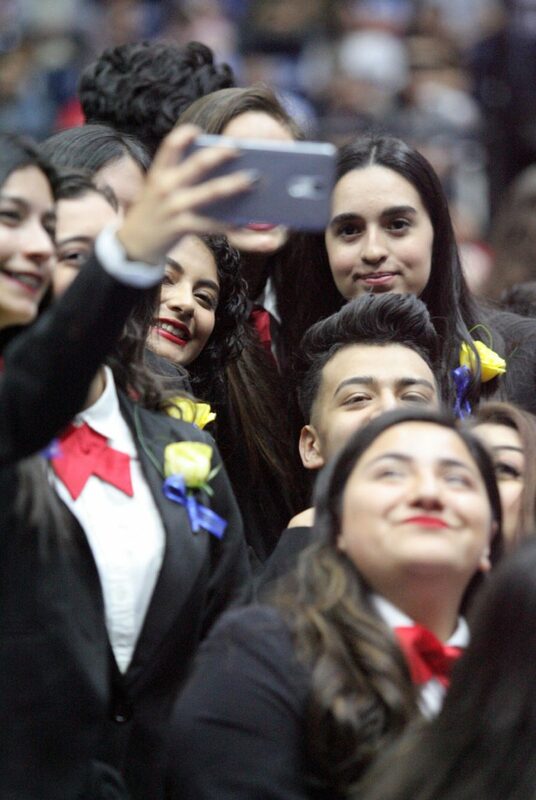 IDEA graduating students take a selfie during the IDEA College Signing Day at State Farm Arena Thursday, April 26, 2018, in Hidalgo. Among the 849 graduates, 450 are first-generation college students. They will attend 313 universities across the country, and $41 million in scholarships were awarded. In 2008, the public school district established Give Me 5 — a staff-funded campaign for students in need of scholarships and emergency loans. Several students from the IDEA class of 2018 received the scholarship; contributors — teachers, counselors, and administration — received a moment of recognition at the ceremony. Middle and elementary students of IDEA were bussed to the stadium and kept the energy high through cheers and a crowd wave. Many brought homemade signs congratulating their loved one and a few blown-up senior portraits were spotted. Parents walked the floor with their graduate, preceded by cheerleaders and the band. Luis Donaldo will attend LIM College to major in business, while Anthony will attend Adelphi University to study marketing. Other students will attend Brown University, The University of Texas Rio Grande Valley, Columbia University and Rice University. One colt will join the Marine Corps after studying for the summer at South Texas College. Through the stress of exams, applications and general high school life, the pair said they were each other’s support system. “It was really a team effort,” said Anthony, who was born a few minutes earlier. Before reuniting with their families, the students reached under their seats for a clipboard containing a contract dedicating themselves to a timely college graduation. IDEA President Joann Gama shared a message with the young adults on the importance of having the confidence to achieve.